"New MIT model paves way for greener use of concrete"
Life-cycle research could help engineers develop less costly, more sustainable designs for roads and buildings. "Steel fiber will make shear walls faster, cheaper to build"
Seattle high-rise will be the nation's first to use a new method to strengthen concrete. 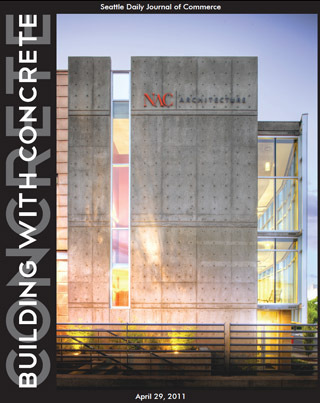 NAC|Architecture's Spokane office addition was the grand winner at the Washington Aggregates and Construction Association's 2011 Excellence in Concrete Construction awards. The project took home awards for cast-in-place structures and sustainable merit. Copyright ©2011 Seattle Daily Journal and DJC.COM.